The Light-O-Rama Diagnostic tool can be used in troubleshooting. It shows a snapshot of your Light-O-Rama configuration, such as registry settings and the version numbers of the various Light-O-Rama programs. 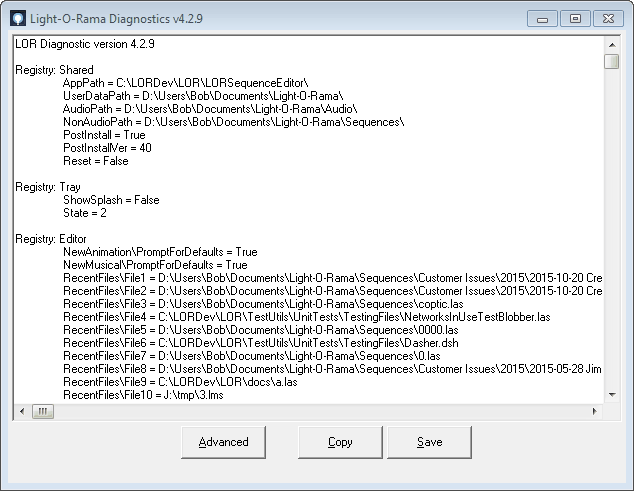 When the Light-O-Rama Diagnostic tool starts up, it may take several seconds before it displays your configuration information. During this time, it will tell you to please wait while Light-O-Rama gathers information. After the configuration information has been displayed, you can copy the results to the Windows clipboard via the "Copy" button, or save them to a disk file via the "Save" button. There is also an "Advanced" button, which can be used to collect additional information that LOR Diagnostic does not collect by default.